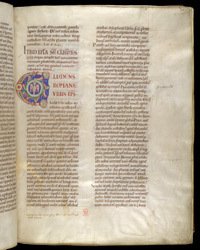 In the middle of the 9th century, an author calling himself Isidore composed and published a series of forged papal decrees. His forgeries remained undiscovered for centuries, because he was clever enough to incorporate them into a collection of genuine decrees. This manuscript contains a copy of that partly-genuine and partly-forged collection; it was probably started in France (or by a French scribe working in England), but the text was finished and the decoration was added at Christ Church, Canterbury. In this initial 'C' the bird (dove?) with a crossed halo represents the Holy Spirit. Human faces in profile emerging from foliage, above and below, are a notable feature of English initials such as this in the early 12th century.